The electronic journal Yesterday (《昨天》) began publication on 31 January 2012, with the aim of 抢救文革回忆 积累文革资料 交流相关信息 促进文革研究. Its editor/publisher is He Shu (何蜀), a prolific Chongqing-based independent historian whose scholarship first began to attract wider attention in 1996, when the Chinese University of Hong Kong’s bi-monthly 《二十一世纪》 published his article 《文化大革命中的外国造反派》. In the same way as Wu Di (吴迪), He Shu is a protégé of the late Professor Wang Nianyi (王年一) (1932–2007) who early on was instrumental in promoting serious scholarship on the history of the Cultural Revolution (CR) inside China. 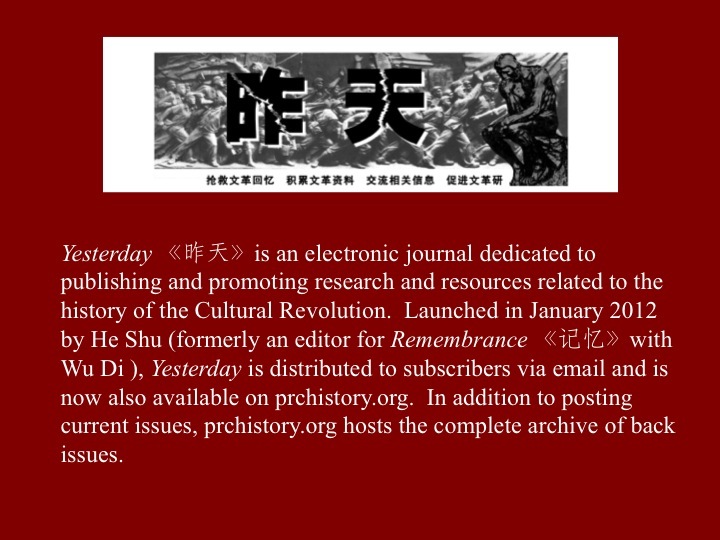 Like the journal Remembrance (copies of which are also available in PDF-format here on the PRC History Group’s website), which Wu Di and He Shu launched together back in 2008, Yesterday appears once a month, and a typical issue contains anything from forty to seventy pages of research articles, original documents, commentary, memoirs, interviews, book-notes, reviews, correspondence, and much more. Yesterday has over the years published a number of thematic issues, including on such diverse subjects as diaries (issue no. 1), the collaborative CR scholarship of Dong Guoqiang (董国强) and Andrew G. Walder (no. 8), women in the CR (no. 13), the CR in Sichuan (nos. 16 & 27), in Shanxi (nos. 19 & 22), and in Guangxi (no. 33), factional violence (nos. 25 & 31), and critical essays on the CR by Xu Youyu (徐友渔) (no. 32), to name but a few. The journal is particularly good at documenting the CR in Chongqing where He Shu for many years has been part of a locally funded oral history project backed by the Political Consultative Conference. Yesterday’s commemorative issue number 36, for example, is a long (86 pp.) list of the names and backgrounds of men, women, and children killed, and descriptions of the circumstances of their deaths, in the civil war that engulfed the city in 1967–1968.